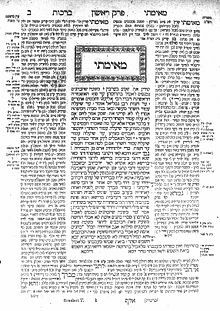 The Vilna Edition of the Talmud, printed in Vilna (now Vilnius), Lithuania, is by far the most common printed edition of the Talmud still in use today as the basic text for Torah study in yeshivas and by all scholars of Judaism. It was typeset by the Widow Romm and Brothers of Vilna. This edition comprises 37 volumes and contains the entire Babylonian Talmud. In its entirety there are 2,711 double sided folio pages. It follows the typical pagination due to Bomberg of printing with the Gemara and/or Mishnah centered with Rashi's commentary on the inner margin and Tosafot on the outer margin. It is also flanked by other various marginal notations from various prominent Talmudists. This edition was first printed in the 1870s and 1880s, but it continues to be reproduced photomechanically all around the world. Plans for publication of the Vilna Shas were announced in 1834 by the owners of the Vilna-Horadna Press, Menachem Man Ream and Simcha Zimmel. Along with a copyright, a restriction was placed on publishing another Shas for twenty years. ^ "Floating Letters: The Widow Romm and the Printing Press of Vilna". ^ "Tosafot". Britannica.com. Rashi's ... on the inside margin ... tosafot ... outside margin. ^ a b Hanoch Teller. Soul Survivors. New York City Publishing Company. pp. 185–203. ISBN 0-961-4772-0-2. Wikimedia Commons has media related to Category:Vilna Edition Shas.